Flat 4 Ashley Gardens01353 610615work Self-catering4 Ashley Gardens. 500m from a superb sandy beach. In the heart of the village with a beautiful walk to the fun of Sunny Hunny in one direction and the wild beauty of the north Norfolk coast in the other. 2 bedroom, 1 twin and 1 double (all linen, towels, electricity and gas central heating are included), sleeping 4 (+2 in a comfortable double sofa bed in the living room). Flat 4 is a spacious ground floor flat to the left of the Art Deco building on a private gravelled road and a short walk to the beach, life boat station, beach cafe, pubs, restaurants, craft centre and the Strandline (imaginative beach combing). Flat 4 Ashley Gardens offers weekly bookings starting on Saturday. 4 Ashley Gardens. 500m from a superb sandy beach. In the heart of the village with a beautiful walk to the fun of Sunny Hunny in one direction and the wild beauty of the north Norfolk coast in the other. Standard rate: £520 for the week. 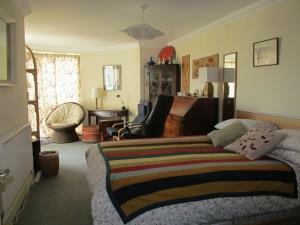 Weekend and midweek if schedule permits 3 nights minimum: £340. Extra nights @ £60 not exceeding weekly rate. 2 weeks: £940. High season (July and August) £630 per week. Arrival from 4pm and packed up by 11am on leaving, but happy to be flexible if other bookings allow. Pets are welcome by appointment.